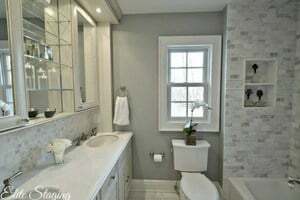 What are the best cool grays for painting walls? 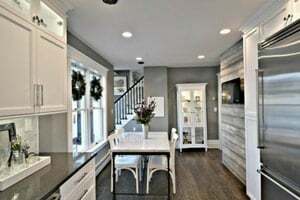 When it comes to painting, gray is by far the most popular paint color – whether it’s for walls or cabinets. It adds depth and dimension to room (especially when compared to white). It’s stylish, soft and neutral…the perfect combo. Gray works so well with dark hardwood floors (the most popular) and it also does well with light hardwood floors. It’s a cool color and cool tones are in – whether it’s for the walls, floors, area rugs and other fabrics as well as cabinets. It just seems to work everywhere. Gone are the days of Builders’ Beige. Beige and other warm colors (e.g. yellows) are so dated…even linen white dates your home. Gray is super neutral and versatile. But did you know that Sherwin Williams and Benjamin Moore make over 100 shades of gray? Yes, that’s enough to overwhelm most homeowners…and many just get confused and overwhelmed when they go to the paint store. So, I’m going to simplify the process and make it much easier for you. 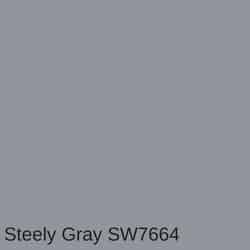 Gray is a complicated color and you’ll see that there are many undertones. So, first, you’ll want to decide if you want a cool gray or a warm gray. Cool grays have blue undertones and give off a cooler vibe. This is a great option if you’re going for a super modern look. They tend to work well with very dark floors, white cabinets, white marbles (or quartz) and other cool grays. Warm grays have green, taupe, beige and brown undertones. Most of these undertones are subtle. They just give off a warmer tone, so that your room doesn’t feel too cold. If you’re looking for warm grays or greiges (combo of gray and beige), check out this article: 9 Warm Grays and Greiges. In this article, I’m going to discuss my top picks for cool gray paint shades. While having a multitude of grays is in some ways a good thing, it can also make the task of choosing the best gray a bit overwhelming. So, I’m going to help you focus your time and make the process much easier. I’ve narrowed this down to my favorite 11 cool grays. While 11 may still sound like a high number, you’ll quickly see that there are really only 4 choices. There are 4 base lighter colors, and then some darker coordinating colors that can be used as accent walls, or for some variation in some rooms. 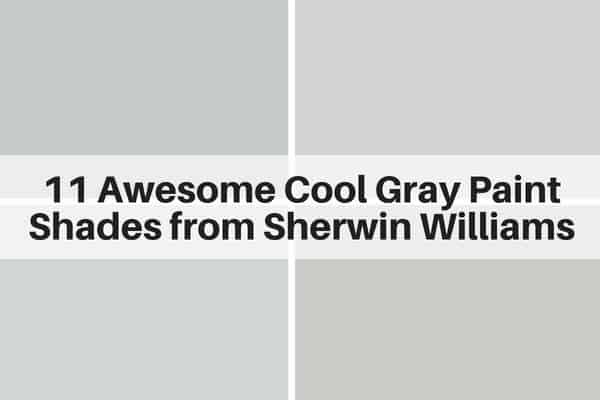 These are my favorite cool gray shades from Sherwin Williams. They are popular and tend to go well with most floors and most furniture. My customers seem to love them, and they just work. You really can’t go wrong with any of them. When it comes to choosing a base color for your walls, I prefer to go lighter. It just makes your space look larger and allows you to go deeper on accent walls. While these colors do work for most homes, I always encourage my customers to get testers and see the color for themselves in their own homes…in their own lighting. It’s especially important with grays with tend to reflect light and take on other colors from the room. It’s ideal to test on all 4 walls as the lighting is different on all 4 walls. Look at the samples during the day, early evening and night time, and make sure you love it. (Learn more here: 5 tips when using paint testers). A quick note about LRV, before I get started. LRV stands for Light Reflective Value and it’s a scale from 0 to 100 with higher numbers reflecting more light…and these look lighter (obviously). Basically, it’s a measures of the lightness or brightness of a color. For perspective, the average blackest black has an LRV around 5% meaning that it absorbs almost all the light, while the whitest whites are in the range of 85-95%. As a rule of thumb, most decorators recommend that your base color be a 50% LRV or higher meaning that it reflects more light than it absorbs. Now this is only part of the story. This can impact your room depending on how much natural or artificial light you have. The more light you get, the more light will be reflected. And, conversely, the less light you have, the less light there will be to reflect. You need the light to bring the paint color to life. While a higher LRV may help, it won’t solve the real issue. In a well lit room, even a dark color will appear lighter, and you will notice the true color and its undertones more. Conversely, in a poorly lit room, the color will look darker and duller. Low LRV colors are 0-35. These colors absorb most of the light. A medium LRV paint is in the 35-55 range. These colors reflect a medium amount of light, but not an excessive amount. 60+ is considered a high LRV, and these colors reflect a lot of light. Gray screen is a true gray…and is often the shade that looks the most “gray” to people. It has blue undertones, so it’s a cool gray. It’s currently THE MOST POPULAR paint shade in Sherwin Williams entire collection. The LRV (Light Reflective Value) is 59, so it reflects more than half of the light and is light enough for most rooms. While I consider it a light gray, it is the darkest light gray of the bunch. 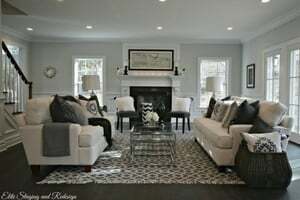 Because it’s a cooler gray, it pairs well with very dark floors and mid toned brown floors, most white marbles and other cool grays you may have in the home (e.g. stainless steel appliances, gray tiles, dark gray cabinets, brushed nickel hardware and many area rugs). For accent walls, I’d suggest Sherwin Williams Online, Network Gray or African Gray (see below). Online is a mid-toned gray in the same color line. It’s a bit deeper than Gray Screen. 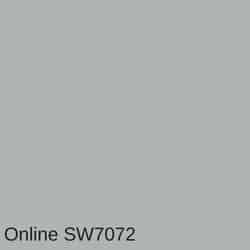 It also coordinates well with African Gray (SW9162) and Software (SW7074) for accent colors. 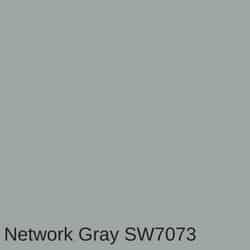 Network gray is a medium to darker gray with definite blue undertones. It has more depth and drama, so if you’re looking for a deeper cool gray, it’s a great option. Or, it can be used as an accent wall to offset Gray Screen (if that’s your base color). It work well in southern exposure or well lit rooms. In dark rooms, it can look too heavy. 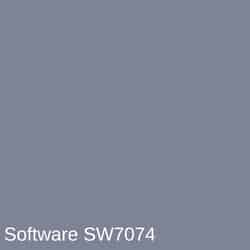 Also, if you choose Network Gray as your base color, then Software (SW7074) or Web Gray (SW7075) can work well for a deep rich accent wall. This is darker gray on the same color strip. It can work well if you want a deep and peaceful color for your bedroom (blues and darker grays tend to lead to a better night’s sleep). Or, African gray can be used as an accent wall for Gray Screen or Online. It’s a darker gray that isn’t too dark if it’s used in moderation. This is the deepest color in the series. As you can see, it’s just a bit lighter than charcoal. It’s blue undertones give it a super cool look. If you’re going for a deep darker room (e.g. for a media room or man cave), it may be perfect. But more often, it’s used as an accent wall with a lighter gray or a mid-toned blue or aqua. Before I cover the next 6 shades, I want to share a helpful video from Sherwin Williams. 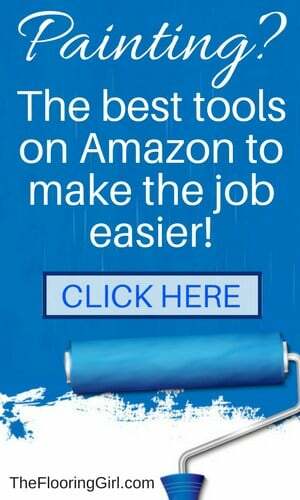 This will help all you DIY painters out there. It’s just 2 minutes and shares advice on best tools and techniques to help make the process faster and come out better. At the end of this post, I provide links to where you can buy some of these products on Amazon. These next 3 shades all coordinate together. I would usually recommend Olympus White for the base color as it’s the lightest. Morning Fog and Serious Gray coordinate well with each other for contrasting accent walls. This is the lightest of the bunch and if you want a lighter and more subtle gray, this is a great choice. It’s still dark enough to contrast well with the white base molding and will give you a fresh and crisp look. 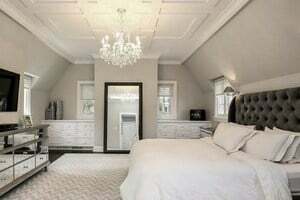 If you want to do an accent wall, my top recommendation would be Morning Fog (see below). While Serious Gray is on the same color strip, it’s usually too much of a contrast with Olympus White. But, if you use all 3 gradations, it can work well. Morning Fog is a bit deeper than Olympus White. It definitely has blue undertones, but it also has a hint of a lavender undertone for a unique look. 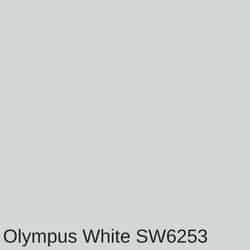 This color coordinates well with Olympus White (SW6255) as well as Serious Gray (SW6256). So, it can be used as a darker accent wall for Olympus White. Or, it can be used as the base color and coordinated with Serious Gray as the accent wall. This is a deeper gray that has both blue and a slight purple undertone. It’s very cool and sophisticated. 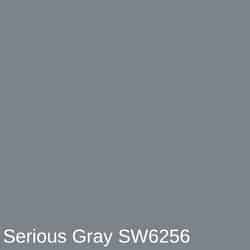 Serious Gray is a great accent color choice for Morning Fog (SW6255). This is a light cool gray with blue undertones (without any purple undertones). In some lights it looks more bluish; in others, it’s a soft gray. It’s calm, neutral and reflective…so it’s a perfect name. It works well with true white trim (see best whites for trim and base molding). If it’s paired with a warm white or off-white, it tends to make the walls look more blue. This is a deeper cool gray. 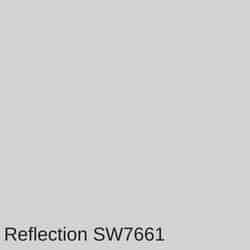 It’s often too dark as a stand alone color (unless you’re really going for a dark look), but it is an excellent choice for an accent wall when it’s paired with Sherwin Williams Reflection (SW7661). As the name implies, it’s a deep steely gray with blue undertones. This is a light cool and neutral gray. In fact, it’s borderline towards the warm grays. For that reason, it tends to blend in and complement almost everything. Because it’s so neutral, even if the gray trend becomes a thing of the past, I predict that this cool neutral gray is here to stay and will outlast the trend. It’s less cool than gray screen and just a tad lighter. 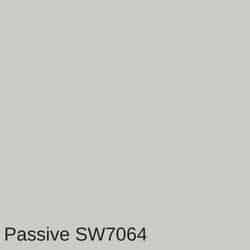 If you’re looking for an accent color for Passive, try Gray Matters (SW7066). If you go much darker on the color strip, you’ll start going into dark gray/brown undertone range. You will find that most American manufacturers, such as Sherwin Williams and Benjamin Moore, use “gray” for their color choices in the US. They will sometimes have an alternate spelling for Canada. But, either way, the meaning is the same. I hope you love these cool grays as much as I do. These colors tend to be very neutral and forgiving. Do not stress about the nuances among them. Just choose one that you love. And, be sure to test the colors in you own home so you can see these grays in your own lighting. Your article on greiges is just what I needed. Showing a sample for each puts it altogether. I am starting to feel confident about my choices for my TV room and we will be selling soon so that works together. Beth – Oh good. I’m so glad to hear that! Thanks for your kind words. They mean a lot. fist time that i painted, it had a warm creamy gray tone but now i bought again, the same code, and is cool with blue undertones. i test many others color and i spent a lot of many but i can find the same color again. im starting to think that the fisrt time it was another color. an error machine. Claudio – Thanks so much. Reflection is a cool gray, not a warm gray. The color difference may be due to the color underneath, if you didn’t use a primer. Or, it could be due to lighting.